A ‘birthday card’ was presented to Company Sergeant Major James Gerald Cameron by twelve members of the Sergeant’s Mess of A Company, 45th Battalion, at Hastiere-Levaux, Belgium, on December 23rd 1918. 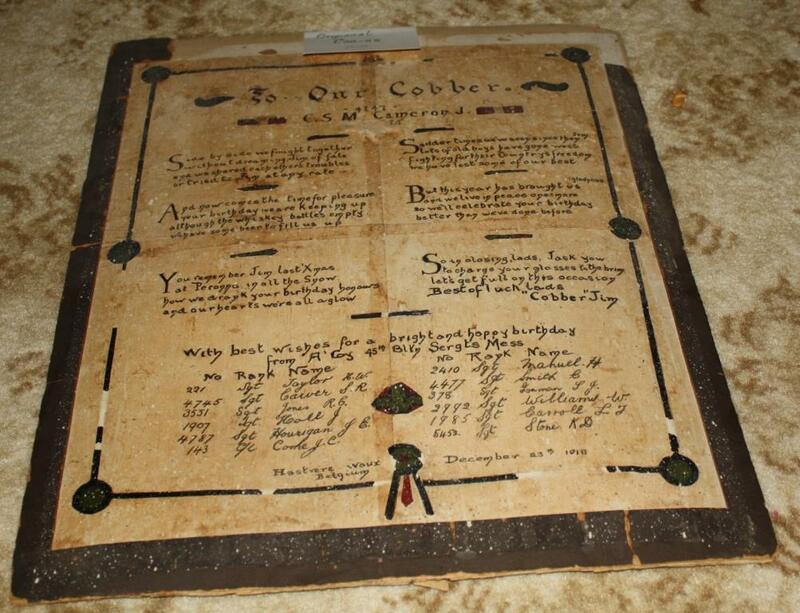 It was made of four sheets of writing paper joined together, on cardboard, and was donated by his daughter Mrs Beatrice Richards to the Gilgandra Museum and Historical Society in 1983. Or tried to, Jim, at any rate. We have some beer to fill us up. And our hearts were all aglow. We have lost some of our best. Better than we’ve done before. 4745 Sgt S. R. Carver (who joined the Coo-ee March in the Blue Mountains) and 4787 J. E. Hourigan (who joined at Parramatta). 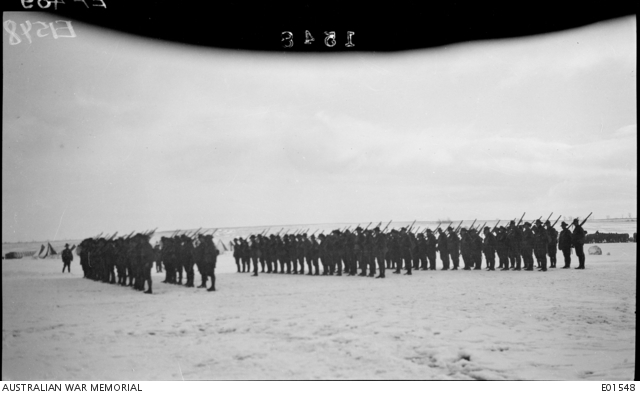 This photograph below is captioned ‘group portrait of the 45th Battalion on parade in the snow at Peronne on Boxing Day 1917’ in the Australian War Memorial collection. The birthday card mentioned that the men drank his ‘birthday honours’ last Christmas ‘at Peronne in all the snow’. The 45th Battalion was stationed at Haut Allaines camp near Peronne in late December 1917. ‘Memories of a Coo-ee’, The Gilgandra Weekly, 2 November 1983, p. 7. Several of the Coo-ees received Military Medals for their acts of bravery during the First World War. 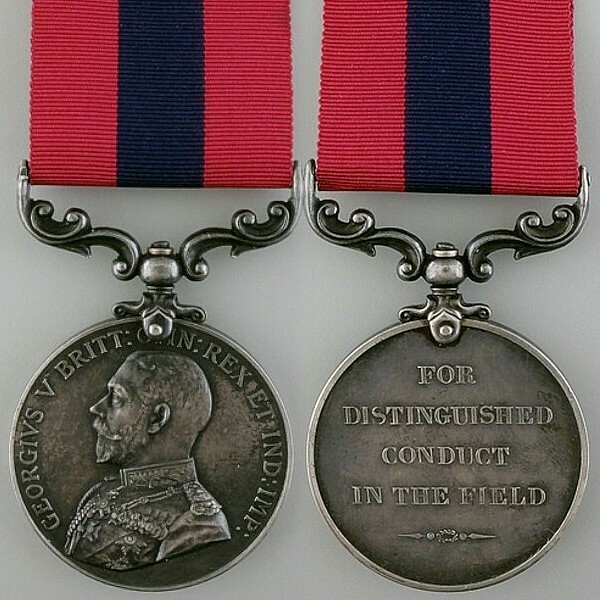 Only one received the Distinguished Conduct Medal. James Gerald Cameron, with the rank of Sergeant at that time, was awarded the Distinguished Conduct Medal for his actions on the 18th September 1918 during an attack near Bellenglise, France. (He later obtained the rank of Company Sergeant Major). Notification of James Gerald Cameron’s award was gazetted in Supplement No. 31225 to The London Gazette, 12th March 1919 (page 3392), and was also published in the Commonwealth of Australia Gazette, 17th June 1919 (page 1012). The citation below for his Distinguished Conduct Medal was published in Supplement No. 31668 to The London Gazette, 2nd December 1919 (page 14907), and also in The Commonwealth of Australia Gazette No. 20, 19th February 1920 (page 191). Per his military service record (regimental no. 4747), James Gerald Cameron was born at Mundooran, N.S.W. [Mundooran was later renamed Mendooran]. He gave his age as 23 years and 9 months, his marital status as single, and his occupation as farmer. His description on his medical was height 5 feet 8 inches tall, weight 12 stone 11 lbs., with a fair complexion, blue eyes, and fair hair. His religious denomination was Presbyterian. He completed his medical on the 9th October 1915 at Gilgandra, but was not attested by Captain Nicholas until the 12th October 1915 at Mogriguy. He claimed to have had no previous military service. On his embarkation roll his address as time of enrolment was Mundooran, N.S.W., and his next of kin is listed as father, J. A. Cameron, Mundooran, N.S.W. ‘One of the men in the big march – Cameron – happened to attend the meeting at Gilgandra on the Friday night before starting day. Moved by Private Lee’s eloquence, he handed in his name. He then rode home forty miles to tell his people of the step he had taken, and, after riding forty miles back, was ready to take his place with his new comrades on the Sunday morning’. Private Cameron departed Sydney on the HMAT A15 Star of England on the 8th March 1916 bound for Egypt. 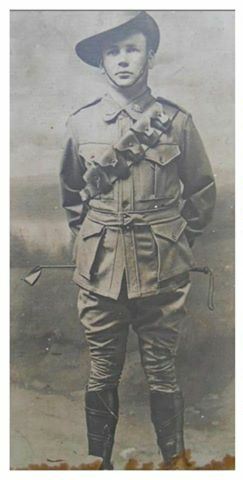 On 12th April 1916 he was admitted to the 2nd Australian Stationary Hospital at Tel El Kebir, Egypt suffering from Mumps. On 18th May 1916 he transferred to the 4th Division Cyclist Training Corps. Private Cameron left Alexandria on the Huntspill on 8th June 1916, arriving in Marseilles on the 14th June 1916. On the 9th July 1916 he transferred to the 1st ANZAC Cyclist Battalion, then on the 26th August 1916 he was transferred to the 45th Battalion, missing the battles on the Somme, and joining the Battalion at the time they were moving to Belgium. On the 5th September 1916 he was appointed Lance Corporal. On 10th October 1916 Lance Corporal Cameron was accidentally injured suffering a dislodged cartilage to his right knee. He was sent to the 12th Australian Field Ambulance, then on 11th October 1916 he was transferred to the 10th Casualty Clearing Station, then to the 3rd Casualty Clearing Station. On 12th October 1916 he was placed aboard the 1st Ambulance Train and sent to the 8th Stationary Hospital at Wimereux, France. He was discharged and rejoined the Battalion on 19th October 1916. He was promoted to Temporary Corporal on 11th December 1916. On 27th March 1917 Temporary Corporal Cameron was again accidentally injured suffering a laceration to his right hand. He was sent to the 12th Australian Casualty Clearing Station, then on 31st March he was transferred to the 1st/1st Casualty Clearing Station. He reverted to the rank of Lance Corporal while he was in hospital. On 4th April 1917 he was admitted to the 3rd Canadian General Hospital at Boulogne, France. On 6th April 1917 he was promoted to Corporal. On 7th April 1917 he was placed aboard the Hospital Ship Princess Elizabeth for evacuation to England. He was admitted to the Kitchener Military Hospital at Brighton in England later that day. He was discharged from hospital on 21st April 1917 and granted leave to report to the No. 1 Command Depot at Perham Downs in England on 7th May 1917. On 25th June 1917 Corporal Cameron departed Southampton, England, bound for France. He marched into the 4th Australian Division Base Depot at Le Harve on 26th June 1917. He rejoined the 45th Battalion on 14th July 1917 when it was resting and reorganising at Kortepyp Camp, Belgium after being in action around Messines. On the 25th August 1917 he was promoted to Sergeant. On 21st March 1918 he was granted leave to England. He rejoined the 45th Battalion in France on 6th April 1918. On 2nd May 1918 Sergeant Cameron received a gunshot wound to his left shoulder during fighting around Villers Bretonneux. He was sent to the 12th Australian Field Ambulance. On 3rd of May 1918 he was evacuated to the 61st Casualty Clearing Station. On 4th May 1918 he was admitted to the 1st Canadian General Hospital. On 6th May 1918 he was placed aboard the hospital Ship Ville De Liege and evacuated to England. He was admitted to the High Barnet Military Hospital in London later that day. On 21st May 1918 he was transferred to the 1st Australian Auxiliary Hospital at Harefield, England. On 23rd May 1918 he was granted leave to report to the No. 1 Command Depot at Perham Downs, England, on 6th June 1918. On 5th June 1918 Sergeant Cameron was admitted to the 1st Australian Dermatological Hospital at Bulford, England sick. He was discharged on 13th July 1918. On 6th September 1918 Sergeant Cameron departed Folkestone, England, bound for France. He marched into the 4th Australian Division Base Depot at Le Harve, France on 9th September 1918. He rejoined his Battalion on 13th September 1918 when it was Poeuilly, France. Notification of his award was announced in Supplement No. 31225 to The London Gazette, 12th March 1919 (page 3392), and was also promulgated in the Commonwealth of Australia Gazette, 17th June 1919 (page 1012). On 23th October 1918 he was appointed Temporary Company Sergeant Major. He was promoted to Company Sergeant Major (Warrant Officer Class 2) on 8th November 1918. On 3rd February 1919 Company Sergeant Major Cameron was granted leave to England. He rejoined the 45th Battalion on 25th March 1919. On 10th April 1919 Company Sergeant Major Cameron departed Le Harve bound for England, to commence his return to Australia. He landed at Southampton on 11th April 1919 and marched into the No. 6 Camp at Sutton Veny, England. Company Sergeant Major Cameron departed England aboard the HT Devanha on 8th May 1919 bound for Australia. He arrived at Sydney on 26th June 1919. He was discharged Termination of Period of Enlistment on 10th August 1919.